Packages in the mail are always great to get even if you bought them yourself. However, it’s hard to decide what to do with the packing material that they come in. Bubble wrap isn’t so bad, you can roll it up and reuse it to pack holiday decorations, moving, or simply sit and pop the bubbles–come on, we’ve all done it! But those pesky plastic peanuts are another thing. They reproduce and cling to everything, like the Star Trek Trebles! So, if you want to go green and unclutter your home, all is not lost. Check with the UPS Store in your area, usually one of the stores is designated to accept and recycle these peanuts. Markdown Mom found another site for recycling your peanuts at The Plastic Loose Fill Council. Or Call The Peanut Hotline 1-800-828-2214. Let There Be Light, But Make It Rechargeable! Markdown Mom has written about the new LED battery-operated candles that are so great since they offer both "mood" lighting and safety. Now, you can also save even more $$$ by getting rechargeable LED candles in a range of prices. One of the more reasonably priced configurations for these candles are made by CanDelight and can be found at Cook-N-Dine. Get a set of 6 tea light with frosted votives, charger, and adapter for $39.99+sh. These candles offer 12 hours of light on a single charge and are safe for indoor and outdoor use. Think of the many uses for this ambient light from outdoor parties, a luxurious bath, holiday lighting, or a romantic evening. Sigh-h-h…. Thrift stores, consignment stores, organic food stores are all part of the ‘think green’ movement. By reusing what we have and food that is grown with the environment in mind, consumers and bargain hunters cannot only be savvy shoppers, but contributors to this overall effort. Hennepin County has declared the month of October as the "Choose To Reuse" month and has put together a special coupon book that saves even more $$$ at your favorite Twin Cities bargain sites. With coupons for an additional 10%-50% off at local thrift stores, consignment stores, Whole Foods Stores, costume rental shops, record stores, vintage stores and other stores with dollar discount and freebies with purchases–this is a ‘must have’ book for this month for all bargain hunters. Imagine the low prices are even lower with this offer–what a great idea! Hurry and pick-up your coupon book good through October 31st. Don’t live in the Twin Cities area? Encourage your local county government to implement this great idea to promote recycling and reuse. This Is a Two Green Thumbs Up Idea! Mark Twain once said that " The man who doesn’t read good books has no advantage over the man who can’t read them." 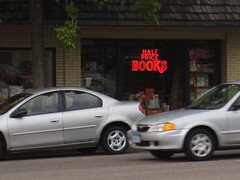 At the Half-Price Books store located in St. Paul, Minnesota you can buy great books, magazines, and records at more than half-price, and take a tour of their rare book collection which includes a volume sporting Mark Twain’s signature; however only serious buyers of the $10,000 book are allowed to view it. This is a chain of 85 bookstores in 14 states and for Minnesota, reviews have been particularly favorable for the Half-Price Books store located at 2041 Ford Parkway as having the largest inventory of clearance books. Celebrating their 35th Year in business on July 27th, Half-Price Books is a great place to look for that special coffee table book at half the price of national chains or vintage LP’s. Periodically these low prices are further reduced by sales and coupons obtained by registering at their online location. Wander to the lower level and you will find those bargain basement deals where prices for books and vintage magazines and journals are as low as $1. Not only sellers of books and mixed media, additionally this store is a buyer where you can trade in your old favorites for some new ones. Take your children and spend an afternoon perusing these treasures–you’re bound to come away with a sack of special finds that will provide hours and hours of enjoyment–MDM did! Our society is always on the go and with daycare, our babies join in at an early stage in this race. Industry has answered the call of bundling our small ones off to daycare with disposable paper diapers. It is with mixed emotions that parents face this choice between being environmentally correct, and the requirement of providing disposable diapers that most daycare providers impose. 2. They cut down on diaper rash absorbing the liquid away from contact with the skin. This is not foolproof, but seems to keep baby drier longer. However, there are ways to cut the cost of diapers and take a baby step toward being green. On the days that MDM was home the disposable diapers were supplemented by cloth diapers with absorbable paper liners during the day. Liners make clean-up easier, and so many improvements have been made to cloth diapers, liners, and underpants that they are worth a second look. 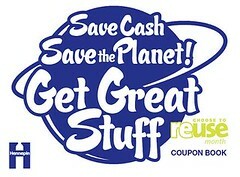 On weekends or days off, think about using cloth diapers to save $$$ and help the environment. Plus there is the mad dash to the store when you find that you are out of disposable diapers. There are more choices on the market now when it comes to cloth diapers and liners. Soft Cloth Bunz is a terrific site with all the latest in cloth diapers, diaper coversand liners, training pants, and accessories. Plus you subscribe to their newsletter with upcoming sale promotions, discounts, and new products. They even help with the downside of cloth diapers–the diaper smell–with products such as Diaper Buddies™. This is a terrific idea with a dual purpose of deodorizing the diaper pail and as a laundry booster when diapers and diaper buddy are added to the wash. How cool is that? At $5.50+sh for a package of 6, both convenient and consumer friendly. Cloth diapers and accessories make perfect baby shower gifts for the expectant parents, ecofriendly and budget-wise for bringing up baby. What Was Old Is Now New-Again ! Checking the classifieds can bring home some local finds especially when governmental institutions advertise surplus sales. Of course, state highway departments will deal solely in cars. Educational institutions will from time to time sell utility vehicles and vans and not only deal in electronics such as computers, overhead projectors and the like, but are a resource of many items, some that may surprise you. Tomorrow, July 9th, a local university-the University of Wisconsin, Superior— will be selling a potpourri of items ranging from a 1000 gallon propane gas tank, air compressors, a diesel generator, sports & exercise equipment, files, office furniture including a sofa, microwaves, televisions, popcorn machines–even wooden snowshoes. Really there is something for everyone from the small business owner to the rural homeowner. Some educational facilities that update labs will often have wonderful cabinets that can be recycled into any modern kitchen giving a unique look mirroring expensive designer kitchens. 1. To get the best bargains, it’s important to get there early. This sale starts at 9 a.m., but you can be sure that people will be lining up much earlier than that. 2. If possible, preview merchandise. As with any sale, if you can get a preview either online, as in this case, or by getting a list of items up for sale for the governmental body–do so, this will allow you to focus on those items you are interested in and skip others. 3. Be sure to bring a vehicle to haul home purchases. Usually these sales are cash and carry. It’s always good to have a tape measure handy. 4. Although most electronics at educational facilities are in good shape since these institutions usually have maintenance agreements with the vendors of the equipment, it is always good to bring someone along with a rudimentary knowledge of how the item works. 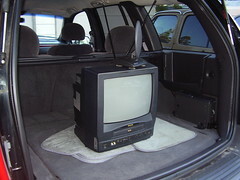 However, as in the case of a laptop computer since they are so popular, first grab then check it out. You can always put it back, but it really is bad form to wrestle it from another bargain hunter. These events are worth the extra effort of changing the time of your coffee break to check it out, or coming in late if need be, and who knows you might see Markdown Mom there, too! If you do, say "Hi!" Tech Deal of the Day: $10-$50 for Computers? No Way! You can get the 3 R’s at School: Recycle, Reuse, and Reduced! That’s what you will find at local college and university surplus property sales. 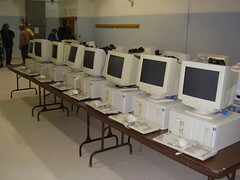 Students, entrepreneurs, seniors, and parents line up early to get their hands on good working computers for dirt cheap. 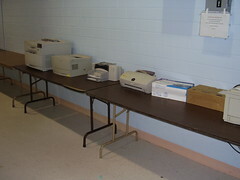 Laptops go quickly, but you will find desktops, printers, and servers going for $10-$50 each. 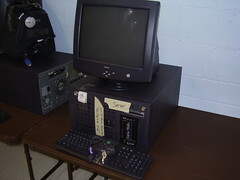 Since these computers have been in operation at these bastions of higher education, they have been kept in top notch condition because of service agreements with the vendors. That takes the guess work out of whether or not you will get a lemon for these ridiculously low prices. Worth contacting your local institutions of higher education to see if they hold sales on computers and other equipment. 1. Inquire if they have a list of the items up for sale, if so, be sure to run to find your choice once they open the doors. 2. For these deals the early birds catch the best deals. On this sale, you just grabbed the tag and brought it up to check-out for payment. To prevent ownership disputes, once the tag is taken, a tag underneath lists the item as "sold." 3. Bad back? Be sure you have a helper since all items are cash and carry. 1. You can buy in bulk from an online supplier and get the cost per cartridge reduced. However, ink cartridges have a shelf-life so be sure to check the dates. 2. You can buy a refill kit and DIY. Hopefully, you will have better luck and less mess than MDM has had with this alternative. 3. You can go to an office supply retailer and have your refill filled by experts and save 50% off the price of a new cartridge. It makes sense to recycle the cartridges this way since a cartidge will take 1000 years to decompose and contain 2.5 ounces of oil (each inkjet cartridge). Did you know that more than 300 million cartridges are dumped in landfill each year? 4. You can make your cartridges last longer. You can print most documents, except the final version, in draft mode and use black/white to copy web pages and other documents that may eat up a lot of ink if done in color. 5. You can buy "generics" cartridges. The downside is that you may have quality problems that could void your printer warranties–however great the savings, it’s best not to take a chance with a very expensive printer. Do your research and know your supplier. 6. Like the old adage sometimes ‘You get what you pay for’. In other words, the higher priced cartridges can last up to twice as long as the cheaper versions. 7. Check what cartridges will fit your printer. Even by the same manufacturer, cartridge output capacity can vary and your printer may accept other models that have a higher output. 8. You may want to consider buying a Laser Printer rather than an Inkjet printer. Laser printers cost more, but the printer costs are substantially less. 9. When buying an inkjet printer, look for one that has separate color cartridges. You will probably go through black ink faster than the other colors, so, it is more economical to replace the black cartridge than having to replace all the colors in the cartridge that probably still have ink. 10. Look for Markdowns. Yes, if you have an older printer, you can find refills occasionally at 30% or greater markdown. One of of MDM’s older printers is a basic Canon printer that is really reliable and does excellent printing, although slower than today’s models. However, from time to time, MDM has found new cartridges markdown substantially at a local department chain store. Even if you don’t need it just then, buy it anyway since sooner or later you will have to replace your current supply. Last July, MDM showed you step-by-step how to save on air freshners especially ones with fans by recycling the bottle and filling it with your choice of liquid potpourri at a fraction of the cost. The more difficult matter was to find replacement wicks since the original ones would only last for one refill. MDM has found two sources for these wicks: E-Scent-ials.com carries Electra’Essence refill packs with 5 wicks in each pack for $2.50 +$5.50 sh and The Samara Company with 10 Electra’ Essence refill wicks in each pack for $5.00. Each wick lasts for 3-4 weeks. Shipping and handling for 2 packs will run you $4.05. Making the cost of each wick around 70 cents. Factor in the cost of the liquid potpourri and you have conservatively reduced your cost by 30%-50% depending upon the fragrance. Additionally, now you have more choices of aromas when you DIY!